Hyperconverged integrated systems have become a vital need for various sectors in recent years due to the growing adoption of digital methods in a growing number of fields of life. The global hyperconverged integrated systems market has been driven by the comprehensive control it provides over multiple arms of a modern, digitalized operating system. The overall reduction in expenditure enabled by the use of hyperconverged integrated systems has made the market likely to prosper in the coming years. In 2016, the global hyperconverged integrated systems market was valued at US$1.5 bn and is expected to reach nearly US$31 bn by 2025, expanding at a robust CAGR of 37.3% during the forecast period from 2017 to 2025. On the basis of application, the global hyperconverged integrated system market has been divided into remote and branch offices (ROBO), datacenter consolidation, server virtualization, data protection, IoT, virtual desktop infrastructure (VDI) and others. Of these, datacenter consolidation is likely to remain a leading contributor to the global hyperconverged integrated system market in the coming years. The rising complexity of data being generated across the world has driven the need for data center technology that can keep up with the dynamic evolution of data generation methodologies. Server virtualization and virtual desktop infrastructure is also likely to remain a key tool in the business sector in the coming years, leading to strong prospects for the global hyperconverged integrated system market. In terms of industry vertical, the market has been segmented into BFSI, cloud service providers, healthcare, government, hospitality, education, gaming and entertainment, and others such as the oil and gas industry. BFSI has been an influential early adopter of digital mechanisms due to the increasing competition in the sector and is thus likely to remain a vital contributor to the global hyperconverged integrated system market in the coming years. The rising use of cloud infrastructure in a number of sectors has also led to cloud service providers emerging as a dominant contributor to the global hyperconverged integrated system market. 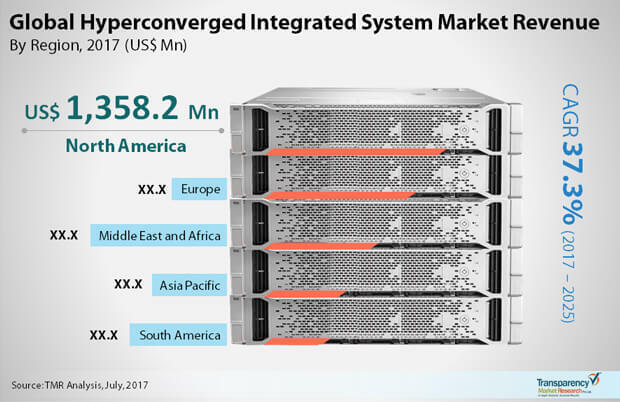 Europe and Asia Pacific are crucial for the global hyperconverged integrated system market due to the immense scope they present for digitization initiatives. Europe is one of the traditional adopters of technological sophistications, whereas several governments in Asia Pacific have taken a proactive stance towards the spread of digitization infrastructure, leading to increasingly lucrative commercial prospects for the hyperconverged integrated system market. The Europe and Asia Pacific markets for hyperconverged integrated systems are likely to exhibit a CAGR of 43.8% and 42.9%, respectively, in the 2017-2025 forecast period. Brazil and Argentina are also likely to drive the Latin America hyperconverged integrated system market in the coming years due to the steady economic progress of the regional powers. The key players in the global hyperconverged integrated systems market are Nutanix, Pivot3, Hewlett Packard Enterprise, Scale Computing, VMware, Inc., Simplivity Corporation, Cisco Systems, Inc., Oracle Corporation, NetApp Inc., Fujitsu Limited, and Huawei Technologies Co., Ltd. The “Hyperconverged Integrated System Market (Application – Remote & Branch Offices, Datacenter Consolidation, Server Virtualization, Data Protection, IoT, and Virtual Desktop Infrastructure; Industry Verticals – BFSI, Cloud Service Providers, Healthcare, Government, Hospitality, Education, Gaming & Entertainment, and Oil & Gas) - Global Industry Analysis, Size, Share, Growth, Trends and Forecast 2017 - 2025”, report provides analysis of the Hyperconverged Integrated System (HCIS) market for the period 2015–2025, wherein the years from 2017 to 2025 is the forecast period and 2016 is considered as the base year. Data for 2015 has been included as historical information. The report covers all the major trends and technologies playing a major role in the hyperconverged integrated system market growth over the forecast period. It highlights the drivers, restraints and opportunities expected to influence the market growth during this period. The study provides a holistic perspective on the market’s growth in terms of revenue (in US$ Mn) across different geographical regions, namely North America, Europe, Asia Pacific, Middle East & Africa and South America. Report highlights the key trends affecting the market in each region mentioned above. Furthermore, region wise prominent countries/regions covered in the report includes the following - the U.S, Canada, Germany, France, the U.K., India, China, Japan, Australia, GCC, South Africa, Brazil and Argentina. The market overview section of the report showcases the market dynamics and trends which includes drivers, restraints, opportunities that influence the current nature and future status of this market. It also provides an overview about the key market indicators given across the five geographical regions. Under the porter’s five forces analysis section, a brief analysis of the level of competition within the hyperconverged integrated system industry and business strategy development is provided in order to determine the competitive attractiveness and intensity of the hyperconverged integrated system market. The report also includes key industry developments covering significant advances made by leading market players over the period of time. On the basis of application, the market has been divided into remote & branch offices, datacenter consolidation, server virtualization, data protection, IoT, virtual desktop infrastructure and others. Datacenter consolidation application segment is expected to show significant CAGR over the forecast period and projected to attribute to the highest revenue for the market in 2025. In terms of industry vertical, the market has been segmented into BFSI, cloud service providers, healthcare, government, hospitality, education, gaming & entertainment and others. The others segment of industry vertical primarily consist oil & gas industry. The report provides the competitive landscape for the hyperconverged integrated system market, thereby listing out all the major players according to their geographic presence, market attractiveness and recent key developments. The competitive landscape section of the report gives an overview about the market share of several key players in for the year 2016. The hyperconverged integrated system market data estimates are the result of our in-depth secondary research, primary interviews and in-house expert panel reviews. These market estimates have been analyzed by taking into account the impact of different political, social, economic, technological, and legal factors along with the current market dynamics affecting the market growth. Factors including market position, offerings and R&D focus are attributed to company’s capabilities. This section also identifies and includes various recent developments carried out by the leading players. Moreover, key takeaways section provided at the end of competitive landscape section would help the operating companies to make the best move in this market. Nutanix, Hewlett Packard Enterprise, Simplivity Corporation, Scale Computing, VMware, Inc., NetApp Inc., Cisco Systems, Inc., Oracle Corporation, Fujitsu Limited, Pivot3 and Huawei Technologies Co., Ltd. are few of the key players which have been profiled in this study. Details such as financials, business strategies, SWOT analysis, and other such strategic information pertaining to these players has been duly provided as part of company profiling.